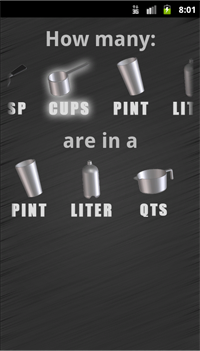 Androgue Development: COOK: Units Button is Ready for Action! COOK: Units Button is Ready for Action! COOK's first feature is complete! A lot of time, my wife and I spend a lot of time cooking with recipes that don't use standard units. The UNITS feature is going to help us convert between units every quickly instead of hunting down a chart or racking our brains for a conversion or google-ing it. When you open the app after your initial setup, tap the UNITS button in the lower left-hand corner. 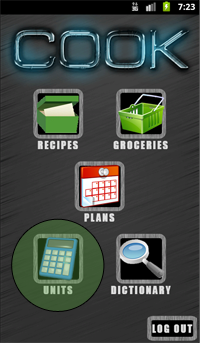 You will be presented with a screen that has two rows of icons representing measurements of volume and weight. 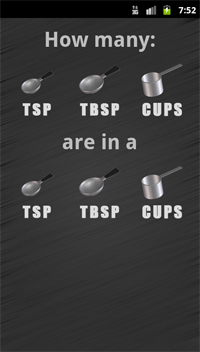 Each of the rows of common cooking measurements moves left and right. Select a unit in the first row of icons to convert to a measurement in the second row. It is basically like putting a sentence together with pictures. 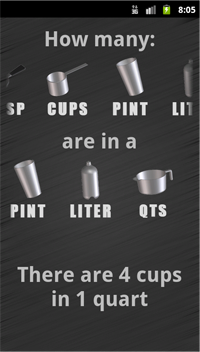 Example: How many (Cups picture) are in a (Quart picture). Your answer will come out below in words. Here is a quick video of the UNITS feature in action. If you have any questions, feel free to contact us using the contact form.